Some of this live album features a backing string orchestra, which was somewhat unusual. It suits the material, however, and provide a different tone to the sound. The sound quality is excellent too - very full and warm. Tracks like "Love-Less" are considerably enhanced by a string backing and Weller's vocal delivery is powerful too. The whole thing is quite impressive. There are quite a few tracks from the laid-back "Heliocentric" album that come across well, like "Picking Up Sticks" and the rhythmic, catchy "Theres No Drinking After You're Dead". Similarly, the rarity that is "Dust And Rocks". The intense "He's The Keeper" sounds good, and is great to hear too. These songs are not found on any other live album, so this is a treat. The rocking "Porcelain Gods" from "Stanley Road" is augmented by strings too, which is certainly different. Even "Heavy Soul" has some sonorous cello "riffs" in the background. 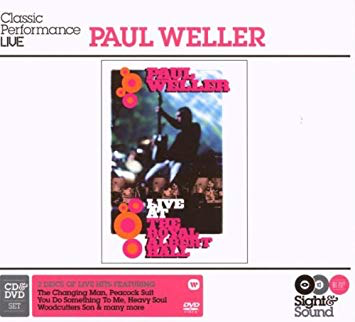 This is a Weller live album with a twist.